Locksmith Scams & Fraud. Was I Ripped off by a Locksmith? There are NO $14-$39 Locksmiths. It is a SCAM. How to Protect Yourself. When you’re quoted low, low prices for locksmith service you’ll pay hundreds over what a legitimate company would have charged. Locksmith fraud companies are quoting low and attractive trip charges to hook you in to booking with them. But you’ll pay much more than that low charge. Only when they arrive do you find out what the real charges are. We recently received a call from a women whose $39 rekey quote turned into a $1200 bill! What was the difference? The crooked company told her that her locks had to be replaced, and they were installing high security locks (both of which were not true). Always find out what the total charges are before hiring a locksmith. Once they show up, if there are any surprises, get them out of your home. If you feel threatened or they refuse to leave, call the police immediately. Don’t get overcharged and scammed by a locksmith. How Does the Locksmith Scam Work? ACME Locksmith receives 2-3 phone calls a week from clients that have been taken by locksmith companies. Sometimes it’s that they were ripped off, sometimes it’s that they need us to come out and repair the damage done by these companies, but the cause is always the same. The consumer was quoted a low trip charge and booked because it seemed like a deal. When the scam locksmith company shows up, the charges quickly increased to astronomical rates. The “locksmith” arrives in a non-marked vehicle. This is a BIG red flag. The “locksmith” says your locks are high quality so they can’t be picked open or rekeyed. They will either need to be drilled and/or replace. This is another BIG red flag. It conveys that the “locksmith” did not have the skills to pick a common house lock or rekey it. Locksmiths do this 1000s of times a year and should have no problem with either unless you have taken specific actions to prevent picking, your locks can be picked. Update: Kwikset Smartkey Locks cannot be picked. The can however be bypassed in other ways but drilling is often used. You can identify a Smartkey lock because it has a tiny little second hole just to the left of the keyhole. You can see them on Amazon here. They are also the only residential lock that essentially stops lock bumping. The “locksmith” does not quote the price before beginning the work. 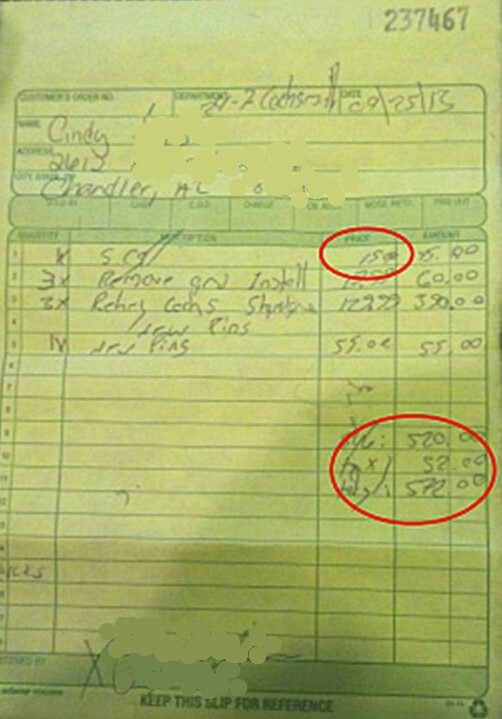 The “locksmith” tells you that you would need to pay sales tax on services. Service calls (i.e. labor performed without parts being sold) are never taxed in Arizona. This is just another way to boost their profit and have you pay to much for lock service. Locksmiths That Appear Legitimate are Overcharging as Well. Historically scam locksmiths promote $19-39 service calls “plus labor,” The scammers then charge up to 50X what a legitimate company would charge. The scammer locksmith receipts had no company name or phone number and the trucks had no markings other than just “locksmith.” So if a consumer wanted to complain about their lock service, who do they complain to? Locksmith are called most often through internet search. It’s typical that customer don’t remember the name and number of who they called once the work is done. If the customer is lucky enough to have called from a cell phone were a number can be recalled, those numbers just go to call centers where no one will assist them in dispute resolution. These companies appear to be real companies. Their name and phone numbers are displayed on their receipts. Their vehicles are often marked. And the quoted price over the phone it not too good to by true, just good enough to get the job booked. The company then arrived for a rekey of one door. This job with any reputable company would be much less than $100. However, the receipt shows that a fresh installation was performed (a hole being drilled into the door to install a lock where no lock has existed before). But this was NOT done. The company was onsite of less than 1/2 an hour and charged $328. The customer asked us for our assistance in disputing this charge. Regrettably we have enough experience in assisting consumers that have been ripped off to know that she will lose her case. Because this company wrote a description of the work and she signed the receipt, she will not win. It wasn’t until after she signed that she reflected on the work done and realized the price seemed way to high. After not getting assistance from the lock company on the receipt, she called us. How do Scam Locksmith Companies Stay in Business? People don’t file locksmith complaints with the attorney general so that the attorney general will go after them. I was specific told by an assistant attorney general several years ago that, “There aren’t enough complaints to make this a priority.” People don’t complain for a variety of reasons. They don’t know who to complain about (no company name/number on the receipt). It takes a lot of time to fill out an official complaint while an online review is quicker. The trouble is online reviews may shut down on particular business listing, but not the business. They just open another listing. People don’t know they are being scammed! What is the national average for a home unlock. You don’t know? Either do most people (it’s currently $93). The bad locksmiths are getting really good at leaving the customer happy. When they present the customer with a huge bill, they offer to discount an item on the bill. Usually by as much as $50. Now, the customer is greatful that they got the discount instead of angry about the price. Clever huh? But most importantly, people don’t know they are being scammed! What is the national average for a home unlock. You don’t know? Either do most people (it’s currently $93). Can I Avoid Locksmith Fraud by Looking at Online Reviews? The answer to this question is complicated. Yes, you can avoid scammers but only if you know what you are looking for. The new bread of fraudulent locksmiths are very smart. It is an industry worth tens of millions of dollars and they know how to get it. Check out this Yelp Review. I came across this 5-star Yelp review while researching a new competitor. What I found surprised me. The most troubling thing about this review is that this person paid 2X the standard rate for an unlock then provided a 5-star-reviews after doing it! Upon reading you’d think this is a great company. They even waived their service call charge to cut the price for her. But here’s the thing. This girl was ripped off. She paid WAY TO MUCH for this door unlock. She paid $134 for an unlock service that any credible company would have charged her well under $100 for. 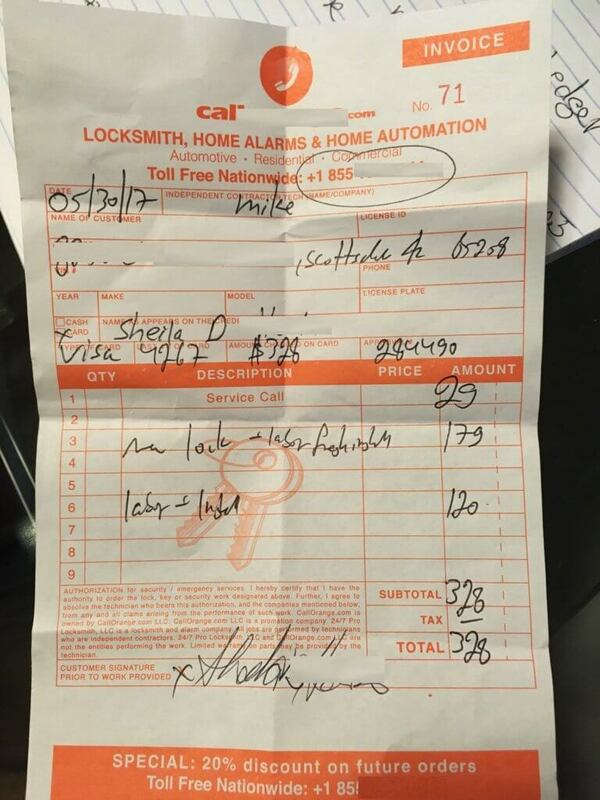 At ACME Locksmith, depending on the time of day and day of the week, this person would have been charged $69-$99 for this service. There is no such thing as an airbag fee! This is a made up charge that companies price gouging claim to be valid. They typically say that the airbag is very expensive and only good for one use. But this is not true. These little airbags are under $20 and can be used hundreds of times. This “locksmith” never intended to pick her lock. His goal was always to jack up the price after demonstrating how “difficult” her lock was to pick. Using airbags to pry open a house door can damage the door, the frame, and is purely an amateur move by someone that clearly doesn’t know what they’re doing. What were the red flags that should have tipped her off? In this case, the $35 service call. Service calls cover the charge it takes to get someone out to your location – including the fuel, drive time labor, wear and tear, etc….The national average for a service call is $69. This allows for some profit to cover these cost. She was quoted a total of $80 to get the door open and ended up paying nearly 2X that amount. There are just no such things as $14-$35 service calls. It’s a scam to bait you into using their service. They will make it up once they arrive. We are seeing this type of intelligent locksmith scammer more and more, where the customer is left completely unaware they have been taken. Fake locksmith are getting very good at hiding any negative reviews by overwhelming the search engines with hundreds of positive reviews. At ACME Locksmith, we take great pride in delivering great service. We have 13 employees and service over 5,000 customers per year. Over a 10-year span, we have earned over 1000 5-star-rated reviews for our company. Everyone of those reviews can be tied to a customer receipt. I can tell you, it is HARD to get a Google review. First, customers need a Google account to write a Google review. If they don’t have an Android phone, they likely don’t have a Google account. iPhone users with Google accounts are uncommon. Second it’s extremely difficult to get a satisfied customer to tout a good service. Once the service is received, they’re getting on with their day. They soon forget about it. The customer’s experience really has to be stellar for them to remember, go back, and write a review. But in just the past year, we’ve seen brand new “locksmith” companies on Google getting 400, 600, and even 1000’s of Google reviews in just a few months. Are they real? These “locksmiths” have circumvented the limited Googles safeguards to get these reviews posted and look completely legitimate to someone who doesn’t have time to do the research. One such company has been in business on Google for 9 months. They currently have over 1000 reviews!!! These guys are great! That’s over 110 reviews per month! I want to hire them, heck, I want to be them! But when we dive into this a bit, the numbers don’t hold up. I’ve confirmed this company has just one driver on the road performing service. A quick locksmith can handle at most 7 calls a day, which includes driving around to and from calls. So they can service at maximum 35 calls per week or 140 calls a month. IF AND ONLY IF, they are fully booked, every day, without a single slow day or holiday. So how is it possible that they get 100% of their customer to write Google reviews? It’s not. If you haven’t guessed it. These customers don’t exist. There are however review farms that overcharging locksmiths hire to write fake reviews. We get solicited by these farms all the time. 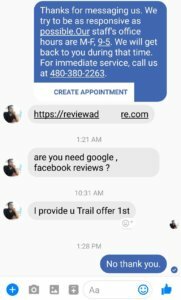 Here’s a chat on my Facebook page trying to get my business and hire them to write fake reviews. These companies create accounts and write reviews; that’s all they do. We’ve even seen these companies copy and paste reviews from other lock businesses onto their own business. Seriously. Word for word. Even when the city/state mentioned in the review isn’t the state where the lock company is located. But who has the time to figure all this out? When you are in a bind and need a locksmith, you certainly don’t. Another company we investigated had 500 reviews in under 1 year, another too good to be true number. So we hired them to see what they were doing. At the end of the service he asked our secret shopper, “Can I borrow your phone for just a second?” and proceeded to write a review on her phone about how good his service was. I couldn’t believe that he asked. I couldn’t believe that anyone would hand him their phone. We believe it’s good business to ask for reviews. If a customer takes the time to write one, then well done. But taking a customers cell phone and rating and raving about yourself, well that seems dishonest to me. And a company using a review farm is way outside of the moral ground. Do you want to hire a lock security company with such dubious morals? You cannot trust a company that is getting hundreds of reviews a month. No locksmith company is big enough to generate that number of reviews. 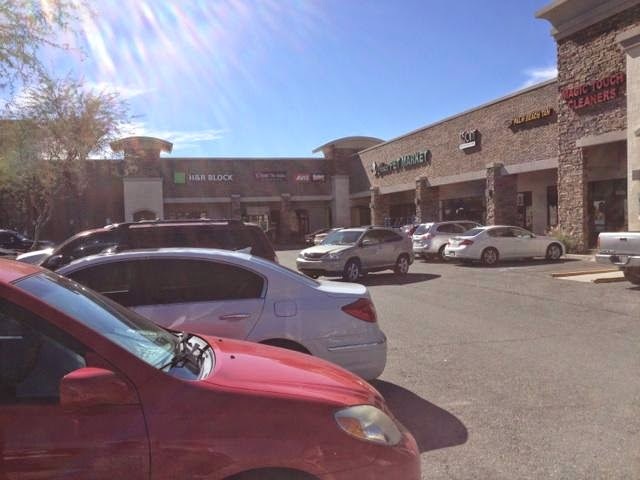 Has the AZ Better Business Bureau given up its fight against locksmith fraud? We’re a long standing and proud member of the AZ BBB. We’ve always considered them top notch. That’s why we were totally shocked today to learn that they had locksmiths listing phony addresses on their BBB profiles. Why is this an issue? Google makes use of location to rank local websites and ads. Scam locksmith companies, those intent on ripping you off, use fake locations to get listed higher in search results. This technique is also used by scammers to trick you into thinking they’re geographically nearby, so that they get your call, when in fact they’re not. 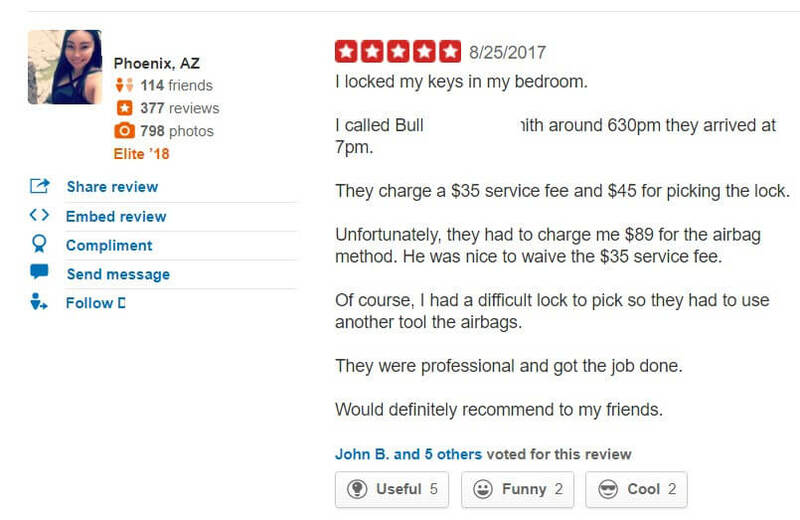 We just found a BBB Accredited, A+ rated locksmith using an obviously fake Scottsdale address. We’re not saying that this company we found will rip you off, we don’t know them, but they’ve already misrepresented themselves. Would you hire them? With local news channels currently airing stories on locksmith fraud, we often recommend consumers turn to the BBB for accurate information and reports. This is especially true for those businesses the BBB puts their “Accredited” seal on. What do we do now? We visited the BBB listed address and found no locksmith there. Hire a licensed locksmith company. Almost everyone advertising as a locksmith is claiming to be licensed and bonded. Ask for their ROC license number to confirm. When they don’t have one, and they’re website is telling you they do, hang up and call the next guy. 1) It gives you peace of mind that the job will be performed correctly. To earn a license, a licensed locksmith must have several years of experience and pass an aptitude test. 2) It gives you a method of recourse should anything go wrong and not be corrected. The ROC has a complaint process that will assist you in getting the issue resolved to your satisfaction. This differs from an agency like the BBB as no constraints are put on businesses to maintain a level of quality. Look for steady reviews, over a sustained period of time. Remember, it’s hard to get reviews. Small locksmith services that are getting 5 reviews per day should raise a red flag. Try as we might, someone will always eventually be unsatisfied, and a unsatisfied customer is very vocal. A company with 0 bad reviews and 500 5-star reviews is suspect. When the bad reviews mention price gouging, be very careful. For the most common lock services, you should get an exact price. Locksmiths rekey locks, unlock houses, businesses & cars thousands of times a year. We know exactly what it takes and exactly what you will pay. Don’t accept a “plus labor” quote for these types of services and don’t except any varying away from that quoted price once they’ve arrived. Quoted $15 for a home rekey, charged $572! A legitimate company in AZ would have charged no more than $125 for this service. When you’re service by ACME, the vehicle will say ACME Locksmith, the uniforms will say ACME Locksmith, and the invoice will say ACME Locksmith. That’s how you’ll know you’re getting ACME Locksmith. Anything short of that, send them away. Here’s the ad she was talking about. It pops up when you do a Google search for “ACME Locksmith” Do you think it’s misleading? The ad doesn’t say anything like “switch from ACME” or “are you using ACME” or “choose us instead of ACME.” In fact, the only company name in the ad is ACME Locksmith. They are trying to trick consumers into clicking/calling them by thinking they’re calling us. 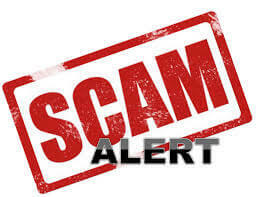 The scam locksmith companies use to use this tactic often but this is from a BBB accredited business! Would you trust them? The story below isn’t about us, but apparently we are not the only local locksmith that the scammers have targeted. NOTE: Identity of Consumer Withheld at Their Request. Emailed to us from customer. I talked to you Tuesday at ~8:30AM. Please keep anything you post anonymous. I’m not sure how much of the story you wanted so here is everything. I locked myself out of my house on the weekend at 4:45PM. I used my iPhone and Google maps to find a local locksmith. I ignored entries that did not have a web site. Comp[…] Locksmith (www.comp[…]locksmith.com) with the number (480)730-[xxxx] was the 5th place I tried. Previous numbers I called either took me to a voicemail, were invalid, or the locksmith wouldn’t be able to come out for at least 1.5 hours. I called them at 5:04PM. I said I needed home lockout service. I didn’t ask for a price quote because never in a million years would I have thought scamming and price gouging existed in this industry. I would think there would be some type of government regulation to protect consumers. I gave them my name, address, and phone number. They told me I would get a call from a locksmith in 15 minutes. At 5:24PM I received a call from the locksmith. He told me could be there in 30 minutes. At 6:01PM he called me because he was close. He needed final directions (this seemed weird. Why didn’t he have a GPS?). He arrived in a 4 dour sedan. He told me his van was in the shop. He was young and friendly. On entering my garage he noticed my toys and we started talking about them and what he has. We have a shared sport. He was knowledgeable about the sport and we talked for several minutes about it. The guy was from Israel so he told me how it was different over there versus here for the sport. He looked at my locks and told me they were good. He would most likely have to drill them but he would try picking them. Up front he told me the price was $180 ($35 service call, $145 to pick lock, and a $20 discount because we shared an interest). I had never used a locksmith and had no idea if this was a fair price. It was the weekend and evening so I figured there was a price premium. It took him ~4 minutes to pick the lock (very scary!). When he wrote up the receipt he told me I could pay with credit, cash, or check. If I paid with cash or check he would not charge me tax. I went with check. When I saw the receipt I was really weirded out. There was no company name on it. It was a generic carbon copy receipt. He wrote “RCA” for the company and “877-291-[xxxx]” for the number. I inquired about the RCA name. I asked him I thought the name of the company was Comp[…] Locksmith. He told me there were some mergers and it was kind of confusing and he wasn’t sure. On his departure he told me I should hide a key somewhere so I don’t have to call him again. He also told me I could call his cell directly if I ever needed any other locksmith service. Because the receipt left me feeling uncomfortable, I Googled the 877 number and one thing lead to another and I found references to Israeli locksmith scams. The guy that came to my house was Israeli so I became worried and wanted some other work quotes. That’s how I came to find ACME Locksmith. I thought of doing a stop payment on the check but the guy knows where I live and what toys he could steal from my garage so I didn’t do it. I don’t think I was scammed like the other Israeli scams. From what I’ve read, those involve an initial low quote. I never received a price quote over the phone. They used my position and ignorance to price gouge me. This weekend I plan to call Comp[…] Locksmith again and ask for a quote to find out if they do quote a low price over the phone then raise it when they show up. I’m also seriously considering an alarm system now because I’m worried he or his friends may try to rob me.